Last week we took a babymoon to Jamaica and had the best time! We weren't sure if we would get to take one or where or when...but everything just fell into place. We haven't been anywhere tropical together since our honeymoon. I was fortunate to go to Turks & Caicos awhile back with some college girlfriends, but nothing for just us! 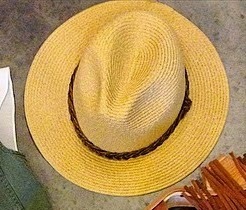 I took a risk and purchased a straw fedora hat for myself at Scout & Molly's. Dave said he liked it on me, so I'll be keeping it and trying it out! I don't always think I can pull off trends, but I think its fun! I'll share more about our trip soon!